Why is Zoho Changing the CRM Game? Zoho CRM has been widely acclaimed as an award-winning tool designed to meet the customer relationship management requirements for small and medium enterprises. This cloud-based CRM tool offers a plenitude functionalities required to automate the daily sales and marketing activities of your business. While there are several other CRM tools designed to meet your specific business requirements, the popularity of Zoho is attributed to its versatile features that enable enterprises to customize the app according to their business specific requirements. As with any other CRM tool, Zoho offers almost similar features. 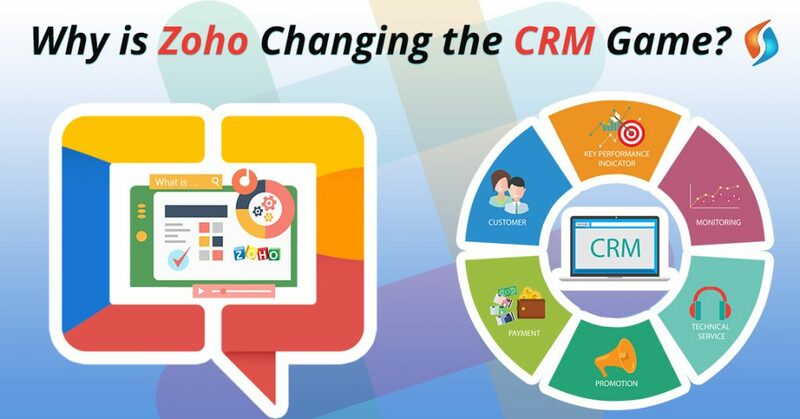 However, Zoho CRM has gradually evolved over the past few years with new updates and advancing technology features to explore new possibilities that expand the functionalities supported by the CRM tool. A feature enriched user interface – The Zoho CRM user interface boasts of several features that are designed to reduce the time spent in entering customer data while providing enhanced scope to engage in exploring new prospects. The streamlined user interface enables users to view all leads, customer activities and sales activities at a single glance. The tools and features facilitate easy and effective management of contacts, sales activities and lead conversions both for small business enterprises as well as large scale enterprises. Social media tools and collaboration options – The Zoho CRM also supports advanced communication platforms using social media, live chat, phone and email. These features ensure an engaging interface designed for effective means of communicating with customers and prospects. The collaboration tools provide various options to post news feed, share updates, information and files while enabling users to manage contacts and interact with customers or other team members instantly. Customized dashboards to track performance – Zoho offers drag and drop features that facilitate the customization of dashboard views. Enterprises can now select the relevant options to monitor sales activities and evaluate the performance of their sales teams using real-time dashboard options that support chart displays, tables and information tabs. Third party integration features – The Zoho CRM supports advanced integration options that enable the tool to collaborate with several third party apps and tools. It provides seamless integration with Google apps, Kanban, Microsoft Outlook and other Zoho apps. This facilitates easy collaboration with different tools while expanding the scope of potential business uses and options available to the enterprise using Zoho CRM. Taking assistance from Zoho developers can be consider as a safe tip for third party CRM integration. Advanced data analytics options – Zoho CRM offers its users with advanced data analytical tools that cater to the complex data processing requirements of your business. Customer related data collected from various sources are processed to provide accurate predictions that are projected to provide leads and prospective sales opportunities. Existing sales data is further analyzed and processed to provide an effective means of understanding the key dimensions impacting sales performance and the means that can contribute to the boosting of sales performance. One of the key aspects underlining the popularity of the Zoho CRM tool is its flexibility that offers enterprises with scalable features and functionalities designed to engage salespeople throughout the process of lead generation to lead conversion and closing of deals. Contact us at info@signitysolutions.com to learn more about CRM apps and its usability in your business context.